Can hold eight "C" cells for portable operation. This model lacked adequate stability and image rejection. Note that, unlike the DX-300, the switch for Wide/Narrow on the DX-302 is for a true IF filter selection. ¼" Head. Jack, S-Meter, Mute Line, ANL, Dial Lamp, Standby, Fine Tuning, Key Input Jack, Attenuator, Antenna Trimmer, Preselector, Dial Lamp Switch, Record Jack, AGC. Estimating the value of a rig can be challenging. 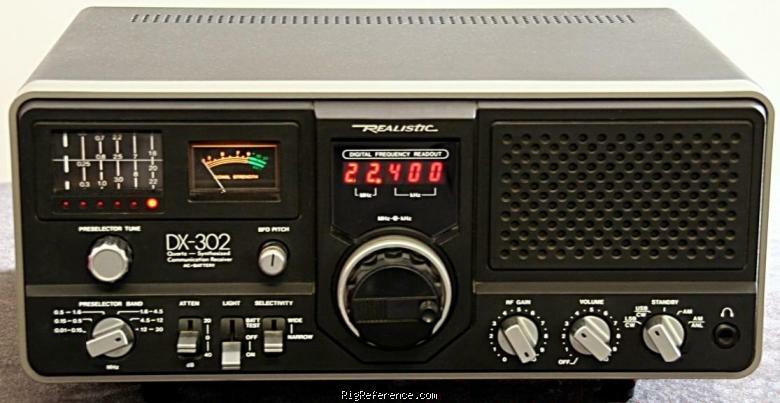 We collect prices paid by real hams over the years to help you estimate the current value of the RadioShack / Realistic DX-302. Just bought or sold this model? Let us know what you traded it for and help other ham operators!